Walking to UC Berkeley from the Downtown Berkeley BART station, onlookers have noticed a peculiar development. A cluster of interlocking rings marks the campus’s westernmost entrance. And it’s crawling with kids. The creator, Bruce Beasley, could not be more delighted. The sculptor is a rock star in the art world. 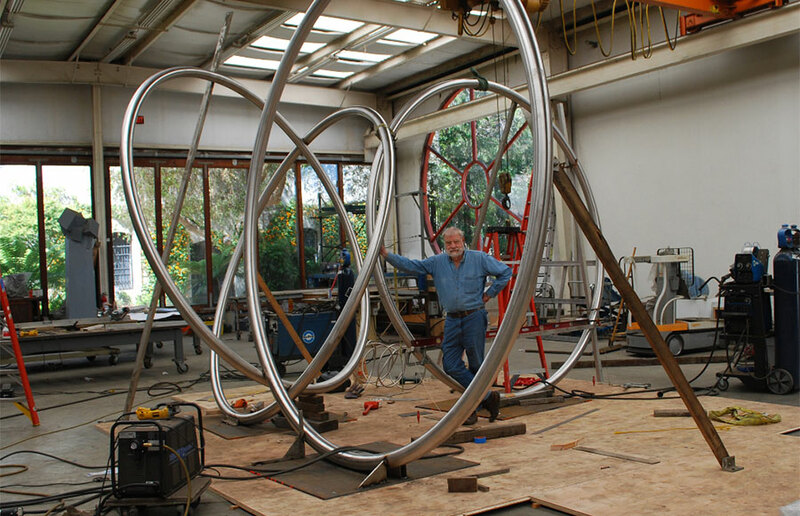 With more than 200 exhibitions internationally and dozens of public art commissions in numerous cities, Beasley has had a string of continuous successes in his 55-year career. From art galleries to public parks to airports worldwide, Beasley’s presence borders on ubiquitous. His largest sculptures fetch more than $1 million on the market. Most prominently, he made a splash at the 2008 Olympic Games in Beijing with a sculpture commission for the Olympic park. 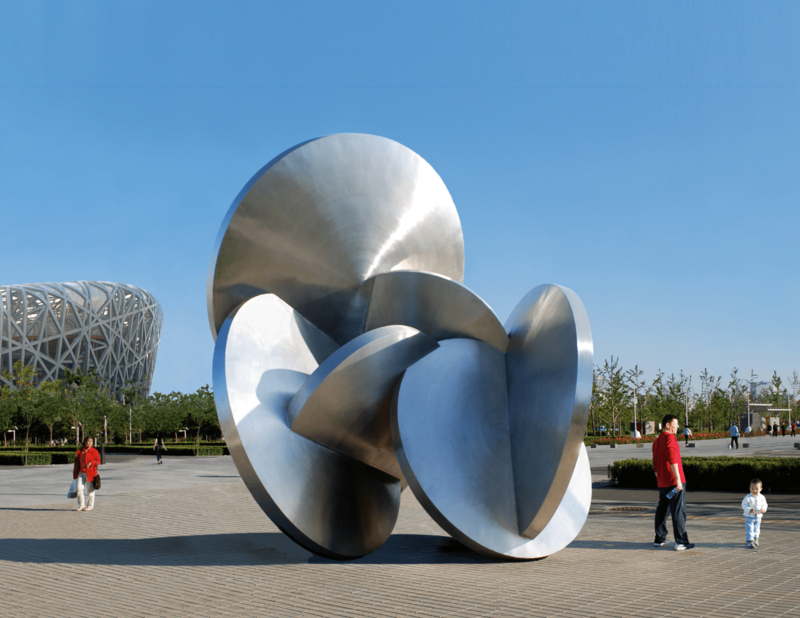 Beasley’s 17-by-17-foot stainless steel sculpture “Gathering of the Moons” in front of the Bird’s Nest Stadium in Beijing. It is set to stay in China. 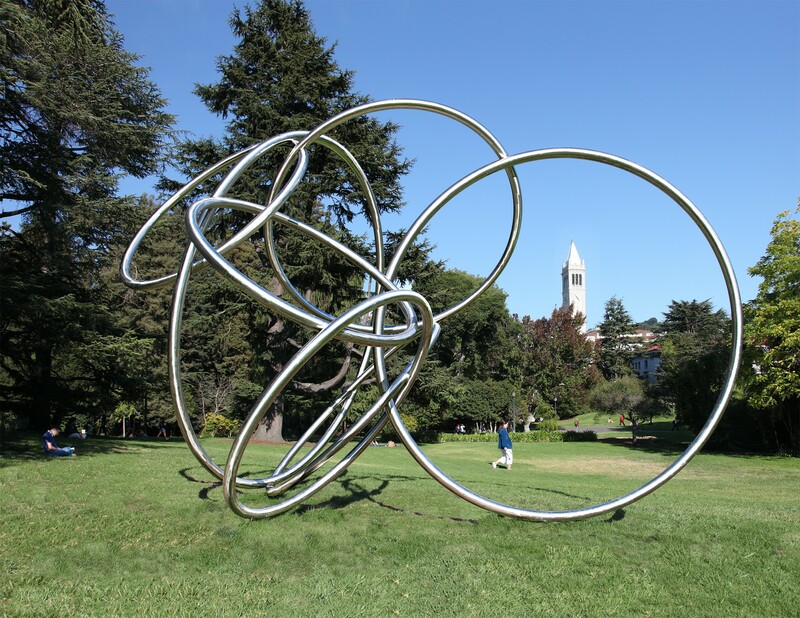 For Oakland-based Beasley, showcasing the sculpture, entitled the “Rondo,” at UC Berkeley means coming full circle with his roots. 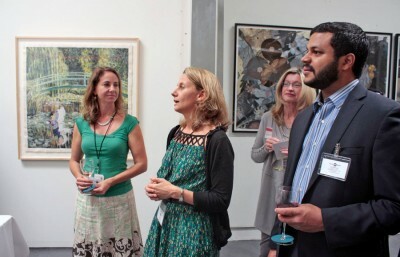 A UC Berkeley graduate with a degree in sculpture, Beasley points to his early years as a Golden Bear as the launchpad for the rest of his career. We sat down with Beasley to find out more. The Daily Californian: Why beautify UC Berkeley? Bruce Beasley: Because I have very fond memories of UC Berkeley. I was there in the ’50s and ’60s. It’s a beautiful campus, and I thought the campus and the sculptures would have a happy marriage together. DC: Any favorite places on the campus? BB: The Faculty Glade … Mature oak trees. Nice grassy contours conducive for sitting or reading. It was a quiet and contemplative place. It’s beautiful. Also, Oscar’s hamburgers on Shattuck. 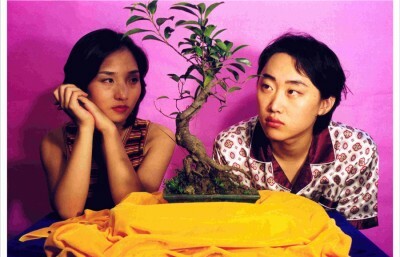 That was a real hangout for the art students. I ate a lot of Oscar’s hamburgers when I was there (laughs). DC: What are your proudest moments as a student? BB: By the time that I graduated, I was the youngest person to have a museum in New York buy a piece in their permanent collection. Then I won the prize for the Biennale de Paris, the largest competitive exhibition in the world for artists under 40. We knocked the socks off the world with the idea that sculptors could cast their own metal. I won the Purchase Prize, which means they bought my sculpture for the French national art collection. We put Berkeley on the art map. The world was rewarding my sense that I had something to offer. I’ve never done anything else since. 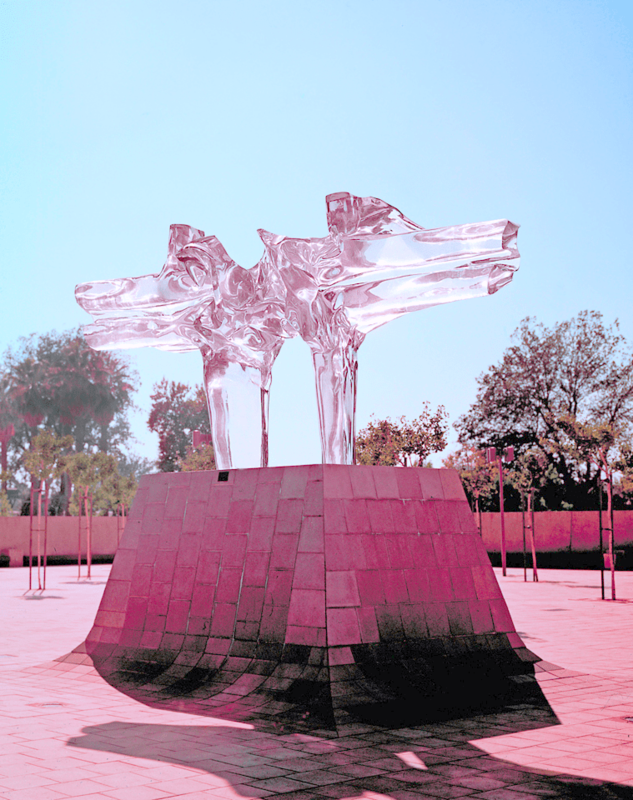 Cast in acrylic, “Apolymon,” an early work, was at once point “the largest transparent object in the world,” Beasley said. DC: Where do you get inspiration for your pieces? BB: It comes from curiosity. I am fascinated by the idea and the feeling that shape is a human language. And so for me, sculpture is a process of exploration more than I feel it is a process of creation. I find the sculptures more than create them. What I like to do is discover shapes that sing to me and hope they sing to others. DC: How did you “discover” the “Rondo” series? BB: I was one of the first people to use 3-D modeling in 1986. I like to play with shapes the way a composer might make a tune by just trying things. I use a number of modeling programs used in the auto design and the aerospace industries. When I know it’s right on the computer, I know it’s going to be right. I made hundreds of possible sculptures, and these five that form the “Rondo” series are the ones that sung their song to me at the end of the editing process. DC: What obstacles did you face creating the project? BB: You are looking at a year and a half’s work for five pieces. This is handwork produced with my chief assistant, Albert Dicruttalo. Now, the impression is the rings pass through each other. Getting the orientations require cranes and forklifts to get them to fit correctly. If they were off even an inch, they wouldn’t intersect, and if they didn’t intersect enough, they wouldn’t be stable. This “Rondo” series sculpture, near the Valley Life Sciences Building, offers a picturesque outline of the Campanile. “Rondo,” a musical term, is an allusion to something that is circular. DC: Your work has attracted a lot of attention. 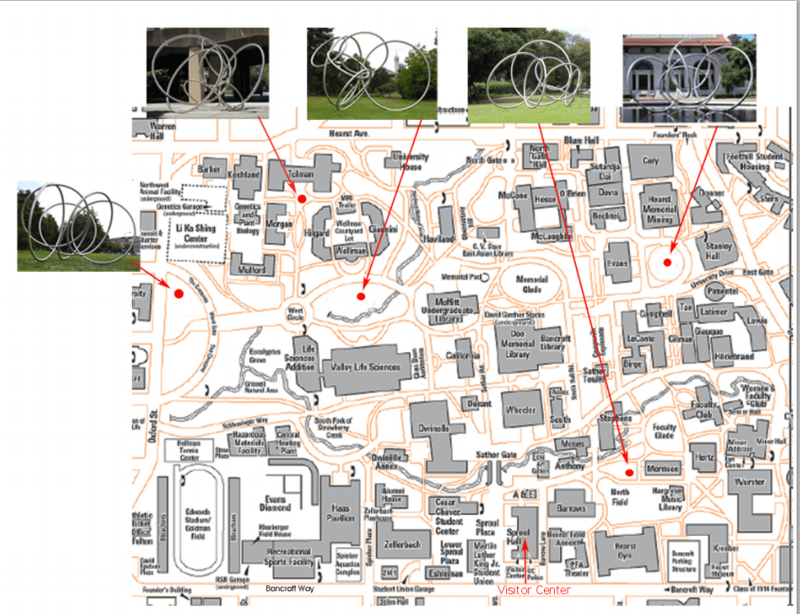 What went into deciding on some of the locations of the sculptures? BB: I knew that the on-campus pieces would have more of a campus-oriented audience. Tolman Hall, for example, is a much traversed part of campus. And the concrete space in front of Tolman looked like it needed something, because it was barren. DC: What have been some reactions? Beasley: People who work (at Tolman Hall) tell me that the sculptures have transformed that plaza. People use the plaza more as a gathering pace because of the friendliness of the sculpture. DC: What is next on the horizon for you? BB: I’m a technological leader in sculpture. I have a sculpture exhibition using 3-D printing next month. I’ve also been completing the arrangement to Oakland Museum so that my art studio becomes the Bruce Beasley Sculpture Garden upon my demise. DC: You are so prolific. What motivates you to keep working? BB: That is the specter that looms in the shadows. It is not physical fear or risk. It’s boredom. What drives me is keeping myself engaged challenged and learning new things. Boredom is the ultimate enemy. As a result, life is as exciting to me at 74 as it was at 19, because you never run out of things to explore and discover. There’s no less creativity now than when I was younger. 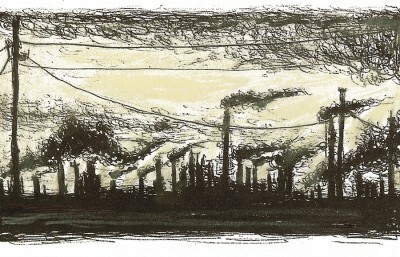 I think that the receptivity to that changes through time, through different political and social contexts. And the creative impulse is widely distributed among Homo sapiens. It isn’t created by culture — it feeds culture. Culture doesn’t create creativity; creativity creates culture. There are endless questions to ask — that’s part of the exciting thing about life. DC: So what, then, is art? BB: Art is at the very essence of our species. It touched something deeply important to us that is difficult, if not impossible, to identify perfectly, but it is an activity mankind has been participating in since the beginning. The “Rondo” series will be on display until August 2014. It was made possible by Jim Horner and the University of California at Berkeley Public Art Committee and was funded by Bruce Beasley.